Everyone said Laparoscopic surgery (through the belly and sides) would pretty much promise me an easy recovery. I suppose I am one of the few with whom that rule does not apply. But then again, I’ve always been a rule-breaker. My girlfriends and I used to drive naked through Waikiki just to see if we’d get arrested. We were seventeen and rife with mischief. We didn’t get arrested and the thrill lasted a lifetime. Fast forward fifteen years and I’m here to tell you – this recovery from surgery is nothing short of daunting and THRILLING never once entered my mind. It’s amazing how we take things for granted when it comes to our bodies. Since my surgery was essentially in the middle of my body, every move I make is affected. Sitting, standing, even using the little girls room is a task. But I am powering through. We all have things in life that we need to power through. We are all worth more than we thought – and in times of struggle, our property value increases with every cry for help. So tell me – what painful experience in your life have you had to power through? Have you taken the time to pat yourself on the back? Surgery is serious, no matter how they get into you. I think they tell you good things to get your mind off of it before hand. Hoping the purpose for the invasion was taken remedied.Take care of you and power through well quickly. I've had a procedure or two during my lifetime. All but one have been relatively easy to deal with, even a cervical fusion. The one exception was a lower abdominal that I would swear was performed with a cross-cut saw… a dull one.Nah! I haven't patted myself on the back. I cramp too easily. I watched Fox News for an hour last week. Does that count? Yikes! Sorry to hear about the surgery but glad you're powering through. 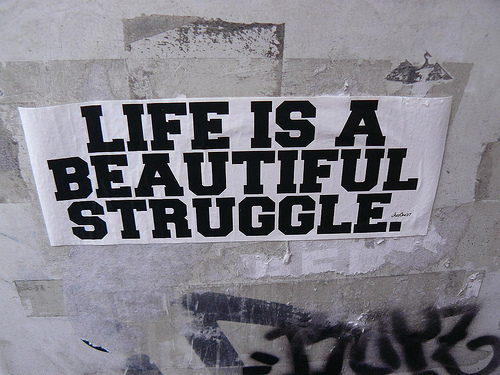 Love the quote on the page "Life is a beautiful struggle." Truer words were never spoken. "The only way out is through"I love that quote. I also love that you and your girlfriend drove naked just to see if you'd get caught. THat must have been so fun. Powering through for me…too many to count. Getting sober is/was the biggest.